The beautiful and grand Quinton glass pendant from Tech Lighting is flawless perfection. 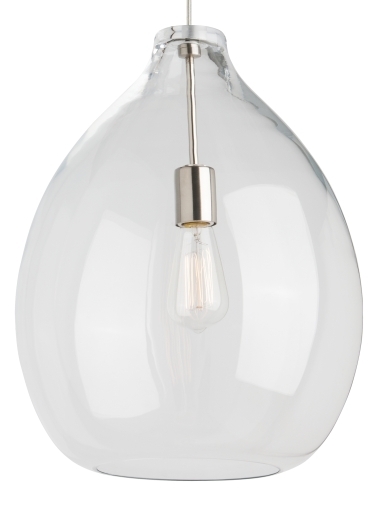 The bulb shape is hand blown by artisans in Poland. This light will create a dramatic, clean and sophisticated ambiance. The LED version of this light fixture features Tech Lighting’s Alva pendant light for a twist of modern style. Includes 120 volt, 60 watt, S21 Squirrel Cage lamp or 14.5 watt, 1000 net lumen, 3000K, 2200K or Warm Color Dimming 3000K-2200K LED module, if LED option selected. Select satin nickel or black finish. In a satin nickel finish, only the 3000K LED module is available if LED option is selected.